While out in the garden this past week I found part of a robin egg. 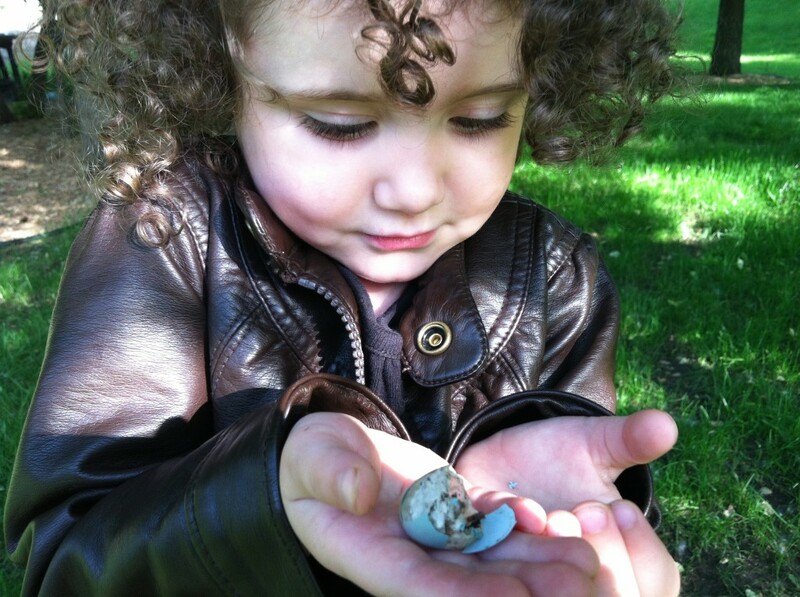 We talked about how the baby bird grew inside of it, and once it was big enough, hatched out. She was concerned where the baby bird was at this moment, and I had to reassure her that it was in one of the trees above us, growing big. Robin eggs are so pretty! She’s wearing a jacket because of the mosquitoes…it’s nice outside but the mosquitoes this year are atrocious! This week we did lots of activities, all initiated by Curly. (Makes my job easier, that’s for sure!) She wanted to play with an unopened packet of ABC Flashcards that came with the LeapFrog Letter Factory video we have. She went through and named them all, said their sounds, and then flipped them over and did it again. I was very impressed that when she ended she picked them all up, stacked them neatly and put them back on the shelf. I hadn’t brought them out because flashcards aren’t in my agenda of things to introduce her to at this time, but she LOVES them! One side shows the letter from the Leapfrog Letter Factory video, and the flip side offers an activity. She also practiced tracing letters on this dry erase workbook. 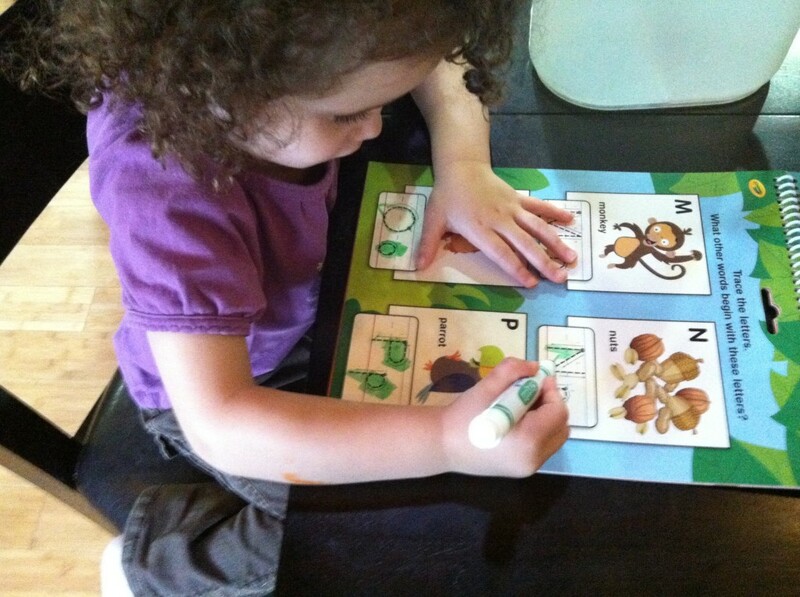 She was really into it – if I have a workbook loving child, it will make me so happy; I love workbooks too! I haven’t pushed workbooks at all. This is her first one. And, of course, we painted. Would our week be complete without it?? I don’t think so! 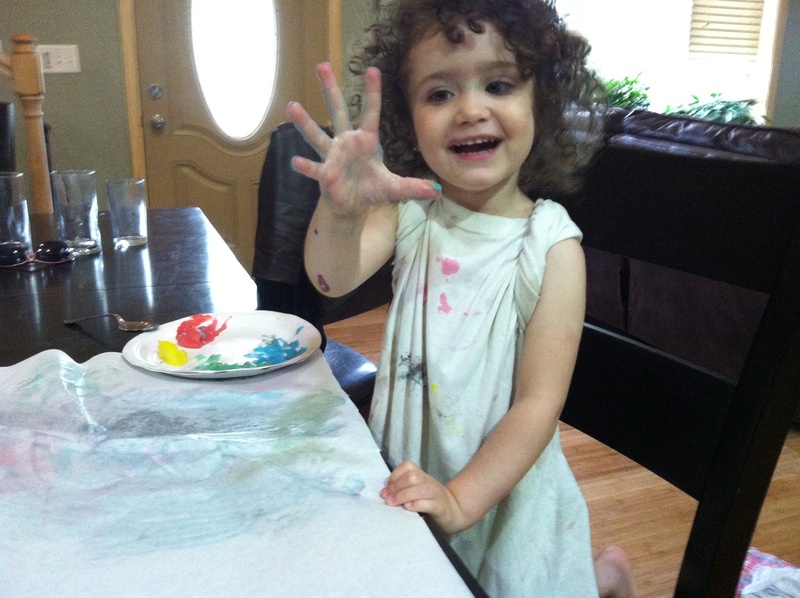 Here she is fingerpainting. 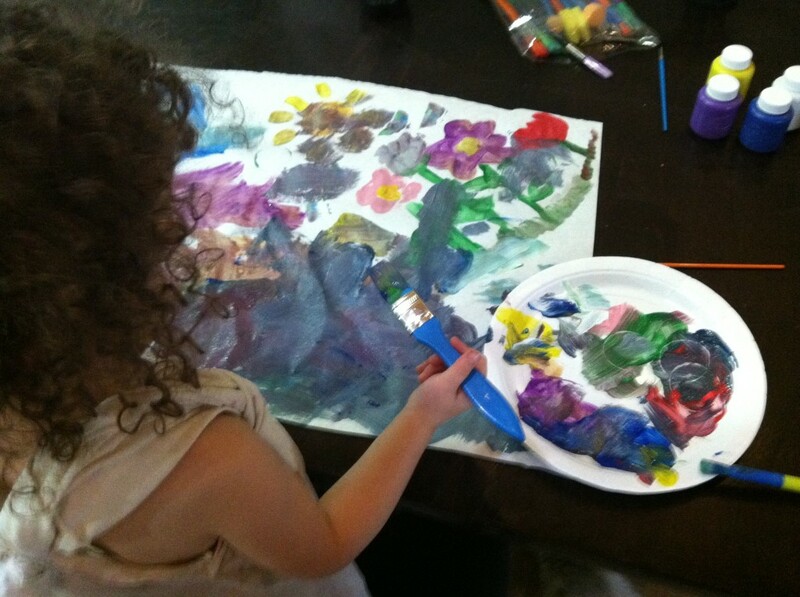 And here she is brush painting. I picked up a big bag of assorted brushes and let her pick which ones she wanted to use. We had a good week! 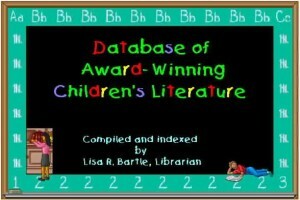 On many blogs and forum posts I have seen people ask the question, “How did you teach your child to read?” I am very interested in this topic, and have noticed that an astonishing amount of parents mention something in common: Leapfrog videos, specifically Letter Factory. I disregarded it at first, as I try not let Curly watch too much T.V. and only have a few videos in the house for her. I spotted a Leapfrog DVD set while shopping, and on a whim decided to look at them. If I didn’t like them, I figured they’d be easy enough to resell. Here is my review: These videos are AWESOME. 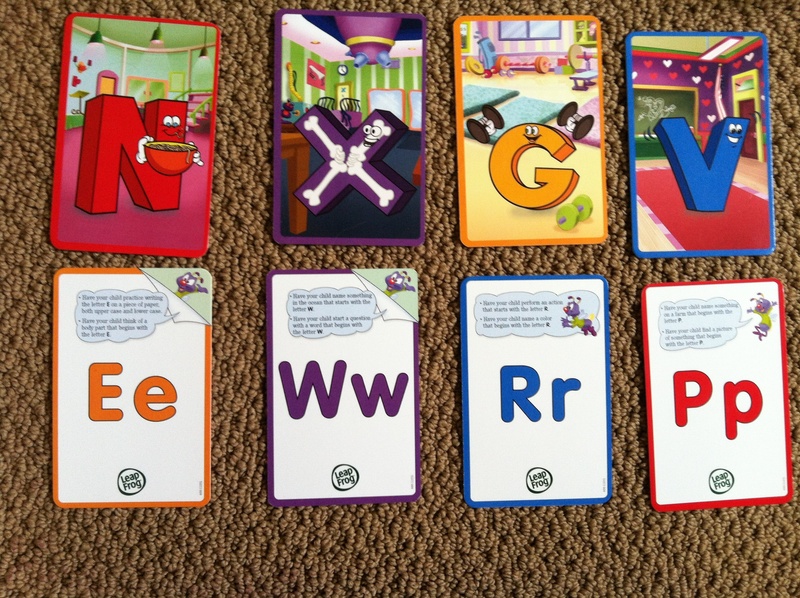 I haven’t seen all of them, but Letter Factory is absolutely fantastic for learning beginning phonics. 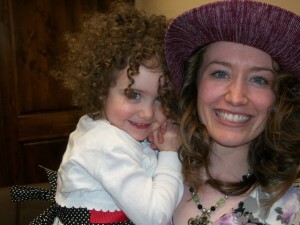 My daughter is 2. Almost 3.